SAINT JOHN, N.B. -- The former chair of the federal cannabis taskforce is warning the industry to play by the rules when recreational marijuana is legalized. 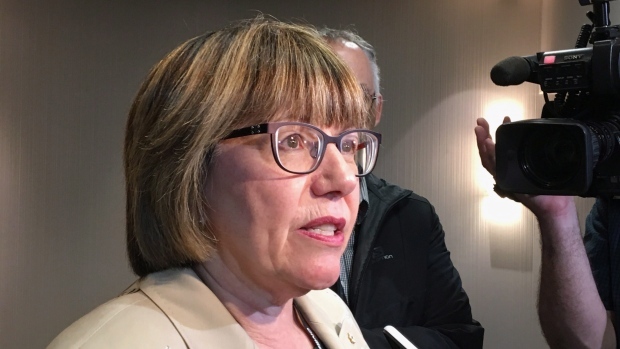 "We've seen this too often with big tobacco and big pharma," Anne McLellan told weed producers Monday, noting tobacco companies and the government have clashed in court numerous times over advertising and branding. "The rules are there ... but they'll push right up against those rules and then make us take them to court, for example, to get clarity." The former federal justice minister said the cannabis industry has the opportunity to play within the rules -- and perhaps get some future concessions. But McLellan told the World Cannabis Congress in Saint John, N.B., that firms could face pushback from government and communities if they don't. "There could be pushback and nobody knows where that pushback might end up," said McLellan, whose task force reported to the Trudeau government in December 2016 and underpinned its recreational cannabis bill. The Senate has approved the bill -- but with nearly four dozen amendments that the government may not entirely accept. Bill C-45 passed in the upper house last week by a vote of 56-to-30 with one abstention, over the objections of Conservative senators. The bill must now go back to the House of Commons, where the government will decide whether to approve, reject or modify the changes before returning it to the Senate for another vote. The cannabis industry has complained that some of the regulations are too restrictive. Health Canada is requiring marijuana packages to be a single, uniform colour without images or graphics other than the logo and a health warning. Ray Gracewood, chief operating officer for Organigram, a Moncton, N.B., based medicinal cannabis producer that is ready to enter the recreational market, has said companies need to be able to compete. "We have to find creative ways to market our product and differentiate ourselves while remaining within the regulations," Gracewood said. "Without the opportunity to develop a brand that's targeted in a responsible way to responsible adults, it allows the industry to be exposed to the illicit market and the continued growth of the illicit market where brands do exist and amazing packaging does exist," he said. Organigram recently announced a number of brands, including Trailer Park Buds, through a partnership with the people responsible for the "Trailer Park Boys" television show. But McLellan cautioned producers not to try to get around the rules. "My advice to everybody in our system is, don't be going in looking for loopholes. Go in saying this is a new, transformative public policy and we have to make sure we are bringing the people in our communities along with us," she said. Derek Riedle, co-chair of the conference and publisher of cannabis culture magazine Civilized, said the branding restrictions go a little too far, but the government appears to be listening. "What they're saying is that we're good to start here, now let's start the dialogue on how we relax things," he said. "This is an evolution we're about to go through. The regs today are not going to be what the regs are in five or 10 years. But we want people adjusting them, not breaking them."